I wrote this article once, and accidentally deleted it at midnight right before bed. It was definitely better the first time. I’m sorry for that. I need a better workflow, or at least I need to figure out why sometimes pressing CTRL-Z erases the entire Blogger text window with no recourse. I wish it’d save iterations or something. I dunno. Anyway. If you're into posts full of nothing particularly useful, then you're in luck! Here’s a long and meandering appreciation of the d30. I love the d30. I have loved it since the earliest days of my gaming history. I try to find reasons to use it as often as I can. I write tables for it even though I know nobody but me can use them because normal people do not have have d30s. My greatest regret is not starting this blog early enough to score one of those fancy Order of the d30 badges that Jeff Rients and Larry Hamilton display on their sites. The d30 has been something of its own hobby for me, I think, in a way. I received my first d30 in a haul of hand-me-down games from an older friend who was leaving town to go to college in the big city. I’ve mentioned that story before. I remember going through and cataloguing all those milk crates of books and various nerd paraphernalia. It was better than any Christmas. Dozens and dozens of fantasy novels. Dice of all sorts, most of which I’d never seen before. Best of all: Dungeons & Dragons! I put things with their like items. All the Azure Bonds books together. I put all the blue dice with chipped edges with the sacred Dungeons & Dragons pile, next to another semi-complete red set; I treated that pile like a sacred artifact. Several d6s clearly cribbed from board games of varying origins all sat on top. When I was done sorting and categorizing my score, I had some leftovers. I think it was some game advert pamphlets, a foldable map of Faerun if I recall correctly, and probably some other things. Most importantly: a very mysterious d30. Over the next weeks and months, obsessed with my treasures, I became somewhat fascinated by this orphan d30. I tried and tried to find where the d30 belonged. I must have read and re-read the Basic D&D book by Mr. Moldvay a dozen times – because where else do you start? – and I was sure I’d missed it. But it wasn’t in there. Ah, the bright blue Expert book, then! That’s the next step for sure. The d30 must be for more complicated things – Expert things. Mr. Cook would point me to the purpose of the d30. But no, he didn’t. Foolish me. It must be part of the Advanced Dungeons & Dragons books, naturally! I mean, a 30-sided die is definitely more Advanced than a 20-sided die. That’s just math. Math is never wrong. But it wasn’t in the Dungeon Masters Guide, or the Player’s Handbook. It didn’t belong to Gamma World, either, even though that book had all sorts of weird stuff in it. It didn’t appear anywhere in the rules to the Star Wars game. It sure as hell wasn’t part of Traveller. I must have spent ten or twenty weekends over the years annoyed and intrigued by that mystery, engaged in a dedicated search for the d30’s origin in the meagre book collection I had. I spent hours poring over those books time and again, trying to find where the d30 was cited in any of the texts. My d30 was black with white numbers, and it rolled off the kitchen table as often as not. None of my other dice were black. It was cooler for this quality. I wanted to use it so badly; not knowing where the d30 actually belonged didn’t stop me from wanting to use it. My first house rules (well, besides the house rules inherent to playing D&D with a 10-year-old’s interpretation of the rules from a mish-mash of books, anyway…) surrounded the d30. I invented uses for it. A total badass warrior bad guy with black armor who used it to roll his attacks. There was a battle axe that rolled the d30 for damage. I concocted a gigantic dragon with three heads who used d30s for his hit dice (I was told this was unfair immediately, and with great gusto). I used it to determine how many goblins rushed into the room just about as often as I thought I could get away with it. I loved that d30. It was the most powerful die in my collection. A little while later, maybe a year or two, thanks to the wonders of late-90s internet email newsgroups, I learned about something called the Armory d30 books. I had never heard of them. I rarely replied to the newsgroup back then because I was very young and meek, but I had to speak up and ask about these books once they were mentioned. I was told they weren’t official, but they had tables upon tables for the d30! If my friend had this book at some point, I sure didn’t get it in my hand-me-down haul! I felt like this was the answer I’d been missing, but I didn’t see one in the flesh until many years later. Several years ago, around 2011 or so, I heard about this game called Dungeon Crawl Classics coming out. I don’t recall how I heard of it, because I wasn’t really using the internet to look up/talk about games by this point and I wasn’t even playing games, either. It was a dark time. I must have found out about it by pure osmosis. Either way, local game stores were all talking about it by the time I popped my head in. I was intrigued, but the thing that really got me was a promotional chart or something – I don’t exactly recall – that listed its specialized dice. Usually, weird dice is kind of a no-go for me; I am hesitant to play the new Star Wars games by FFG because I don’t really want to mess about with even more purpose-built dice I have to learn and keep separate from my other dice. But this was different! It was supposed to use the d30 prominently, along with a ton of dice I’d never even heard of or imagined a use for. I didn’t run out and buy it, but I couldn’t get it out of my head. Awhile later, I got to play a number of funnels rather unexpectedly, sharing dice with a friend. I was immediately hooked, but my plate was full at the moment and I couldn’t drop everything to play it regularly. One day a little while later, I strolled on down to a game shop and what should I spy but a single tube of green DCC dice. At least, I think they were green. Anyway, they might have been green, and they came in a plastic tube. I don’t even care for green dice, if we’re gonna be picky about colors, and I didn’t own a copy of DCC at the time (which is weird for me, because if I enjoy a game enough to play it more than once I always buy the book myself) but I grabbed them right off the rack anyway. I definitely recall that I paid through the nose for them because everything is too dang expensive in Canada, but I had to have that tube. It had a d30, after all! I was so excited to get them home. 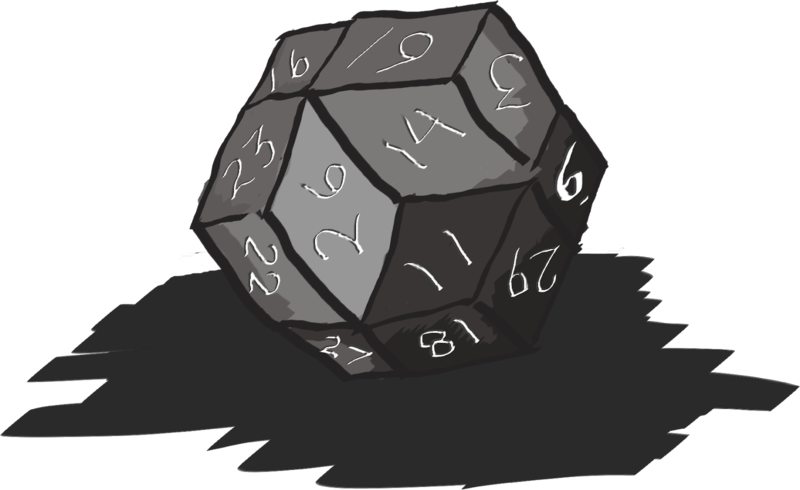 When I finally got to my place, the first one I rolled onto my kitchen table wasn’t one of those weird dice I’d never seen before – it was the d30. Nowadays I live in Texas. That’s after yet another move, this time across the continent to a new country, leaving my whole RPG collection behind in my homeland. I came down with really nothing. It wasn’t planned very well, but I bet you got that impression from some of my previous moves, too. But it worked out okay. Here, I have several d30s. A black one with white numbers, a lot like my very first one, sits on my desk in front of me as I type this, next to a matching d60. A gigantic, oversized d30 in red with white numbers (my favorite color combo) rests right next to them. I got them at a local shop down the road that, for some reason, doesn’t have a single DCC dice set despite selling the game books. I even bought a d14 and a d16 a la carte from them, but I can’t lay my hands on a DCC set to save my life here. Weird. Nonetheless, they had d30s and d60s a-plenty, and when I saw them, I eagerly grabbed them. That's about it. I love the d30. To this day, I have no idea how my friend came to have that d30 he passed down to me. We never got to speak again. I don’t know what product or shop he found it in. We lived in a very tiny town about three hours from the nearest city big enough to support a hobby shop. But I’m glad he did, and I’m glad he passed it on to me. More games need to use it. This post was a pointless stream of personal nonsense but hopefully it interested someone out there. Since you made it this far, here’s a d30 table for your trouble. The Red Spring – Cursed pond with water perpetually the color of blood, said to be where a tyrannical old king killed his wives when he grew tired of them. A great and unnatural disc of stone, at least the size of a castle’s grounds, slowly orbiting a mountain peak. A sea of indigo grass, thirty feet tall if it’s a foot, sways in the gentle breeze. The Silver Forest – An ancient elven wood so very fey that those mortals foolish enough to enter return centuries later without having aged a day, quite mad, and very different. Fom, the Giant King – Hugest and dimmest among the trolls, he sits on his snowy mountain crag each day, tossing down boulders just to watch the avalanches it creates. A convoy of over two-hundred carriages winding their way to the westward reaches on a seasonal religious pilgrimage. The Devilish Fen – Boggy and inconvenient, this fen is said to be littered with lost caravans abandoned by merchants due to floods. At low tide, from this high up, it’s obviously true. A procession of the scarred ones, heretics deemed unfit for society and marked accordingly. A herd of massive triceratops dinosaurs slowly grazing across a calm plain. In the middle of a clearing in the woods, an eerie white obelisk with the glitter of gold erupting from the top like a fountain. The Six Standing Stones – Erected in ages past by six human kings who united to stop the war between the elves and the dwarves. They ring and hum even now. A castle of black stone. On its ramparts, peasants writhe in agony, pierced through by pikes. Smokesign Cleft – A roost for wyrmlings, those petulant, conceited, domineering cousins of dragons who terrorize farmers and burn villages. An army on the march, raising their red-eyed banners high. Salventarion, the Tortoise – The father of all turtles, so great that his footsteps shake the world and a house has been erected on his back by an unknown weirdo. The Valley of the Blight – A deep divide in the land where tremendous lavender-colored mushroom forests hide the fungal zombies that lurk in the dim undergrowth. Goblet of Kings – A mountain, the top of which was long ago inverted through sorcery. Instead of a peak, it holds instead the clearest, cleanest, coldest lake in the world. A pod of eight-finned megawhales leaping in and out of the languid waters of the southern seas. The shadow of a huge roc sweeping across the sky in lazy circles. The Fern – A titanic fern from eons past. It dwarfs all nearby flora and its curly fronds open and close with the dawn and dusk. It is considered an ill omen when it does not. A windmill in field of wildflowers, where flights of butterflies delight on comfortable breezes. River of the Damned – A rapid, deep river that winds and bends. Only the foolhardy and the extremely expert dare try to ride it, but it is the fastest way to reach the southern seas. A gnarled bramble patch at least one day’s travel wide in all directions in the middle of a barren, deserted flatland. Temple of the Fat Prince – An opulent religious site on the top of a rather idyllic hill. Locals are entreated quite forcefully to tithe heavily for the Prince’s cosmic favor. Xalaloc, the Serpent – In the western waters, the head and tail of Xalaloc rhythmically ply the waters she calls her domain. Locals fear her wrath and worship her as a petty god. A beautiful waterfall splashing down on brilliant purple and orange stones the size of manor houses. A stream which defies logic, flowing backwards in loops inexplicably. A town on fire, set alight by pig-faced malefactors. It sparkles red and yellow because of the handfuls of “sorcerous” salts they toss about, dug out of the pits they call home. The colossal skeleton of Shum, the former king of the giants. In fact, to hell with it, you put up with a lot today. Here’s another. You deserve it. The Hands of Baal – Dedicated to proselytizing the good word of Baal, the Desecrator, who promises defilement to adherents and worse to opponents. Woundpriests – Flagellants whose activities maddened them into experiencing a hallucinatory enlightenment. Synod of the Holy Rib – They found a rib. It was a particularly large rib. Surely it was God’s rib? Father’s Fingers – Overzealous and belligerent preachers of the word of The Father, who is, of course, a many-eyed godwyrm from the vast reaches of “space,” where the stars live. Helenoctinites – Believers in The Tablets of Helenoctinus, who professed to have chiseled the wisdom of the gods as they spoke it to him in the hills. He was illiterate. The Red Womb – Those who adhere to the belief that all followers who perish in battle are sent to a cosmic womb to be reborn into the world. Stage regular traveling ritualized gladiatorial combats. The Order of the Lizard – Descendants of an archaeologist who discovered an ancient race of lizardmen he claims predated man and lived in harmony with the gods. Blue Monks – A group of silent monks in flowing robes. They practice goodwill towards others, usually by converting them to the cause of silence. Watchers of St. Zux – St. Zux is said to rise from the grave to bring word from the depths of hell when the hour is right, so they carry his mummified corpse everywhere. Zagam’s Sons – They seek to taint all wines and ales brewed by living hands to induce babbling idiocy in those who would imbibe it, in his name. Guardians of the Second Sun – Believers that the sun’s brilliance hides a second, dimmer sun from view, and that is where the gods live. The Eligoic Order – The believers of this faith insist that by praying to this great demon on his throne of skulls, their spouses and sons who do battle will be carried safely through. The Legion of the Green Sight – Fervent meditation has caused them to grow a third eye. They keep it closed most of the time because it shines blinding green light when open. The Worm Sect – Beneath the world a great worm lays slumbering. When she wakes, she will eat the world and the sun and the stars. Those who worship her now will be taken to her dreams before she wakes. Sisters of Ash – Virgins who worship a demon who lives in a volcano and accept tithes to sate the demon and prevent earthquakes and eruptions. Each is disfigured by identical burns on half of their body. The left half, always. Organseekers – Seeking to revive a dead god, they cast auguries and prophesies to locate the individuals who contain each of his organs. Bloodletters – These zealots walk naked through the wilds and seek to drain the blood from all fair-haired persons so that the world can rise to heaven. The Church of Forneus – They hold all fish as sacred to appease their god, a sea monster from the court of hell, who will one day wash the world clean. The Walkers in Red – These hooded adherents claim to know who holds heresy in their hearts. They seek to cleanse the world of demons. Most of the demons they see sure look like people to everyone else, though. Rockwatchers – Somebody (no one remembers who) once saw this big rock outside of town glow bright blue. Now, someone must be watching it at all times. Rocksaviors – Somebody (no one remembers who) figured out this big rock outside of town will only glow bright blue. Now, no one can look at it. The Order of the Paw – This group believes all hounds are divine, and seeks to release them from the servitude of man at any cost. Usually pretty nice about it. Sometimes very not. The Zifaanists – A sect dedicated to preaching the goodness of poverty and meditation. Most are emaciated. Many die of starvation. None are deterred. This is the plan. The Red Eyes – These pseudo-priests seek enlightenment in clouds of narcotic smoke in great halls. Those who perish from the toxic smoke are said to have learned too much of reality from the spirits who speak. Ronodites – Followers of Ronodus, a prophet claiming to know the plan of the Returning Gods, who ruled once, and will rule again. They brook no disagreement. The Wives of Shax – An all-female congregation that espouses the rightful restoration of Shax, cast out of heaven, to the holy throne of the usurper. The Tragerites – These zealots believe their founder, who some claim to be both blind and quite mad, did in fact see a race of great, furred men in the woods. The Pink Tabernacle – A quartz tablet the size of a house and covered in thousands of lines of text is dragged by beasts of burden as zealots scream themselves hoarse alongside it, preaching the doom of all non-believers. The Choir – Those who have sworn an oath to sing all things (the Book of All Things being their holy tome, and the home of the only phrases they can still utter). Those Who Blame – There are those faiths which urge a path of non-judgment. This is not one of those faiths. All who adhere to this are tattooed with their sins by those they have wronged. Okay, I’m done. Now you can yell at me in the comments or over on Twitter @dungeonspossums for wasting your time. Not a waste. Quite cool. I’m not sure I’ve ever seen a d30 IRL. I am quite happy with using a d6 and d10 to generate a d30. Seems natural to me since a time long ago when for some reason d20s were missing from a game and we just used d6 and d10 to simulate a d20. I actually like d60 a lot too: you can make some amazing tables. With a d6 you can have an ‘odd’ d30 table and an ‘even’ d30 table. Put them side by side with the numbers in the middle, for example. I think either CTRL-Y or CTRL-R should recover your text after a CTRL-Z. Thanks for sharing your experience of an ode to D30 with us. A role-playing game is that in which players assume the roles of characters in a fictional setting. This game often share rules and settings with tabletop RPGs, but emphasize character advancement more than collaborative storytelling. It is really amazing fictional game.